Review by AllTheBestFights.com: 2018-08-19, good finish between Shavkatdzhon Rakhimov and Robinson Castellanos: it gets three stars. The undefeated Shavkatdzhon Rakhimov entered this fight with a perfect boxing record of 12-0-0 (9 KOs=75%) and he is ranked as the No.13 super featherweight in the world. In his last three bouts he has won over Jimmy Paypa, Emanuel Lopez and Malcolm Klassen (Shavkatdzhon Rakhimov vs Malcolm Klassen). His opponent, Robinson Castellanos, has a record of 24-13-0 (14 knockouts) but he is not ranked as he hasn’t fought since July 15, 2017 when he was defeated by Jezreel Corrales (Jezreel Corrales vs Robinson Castellanos). Before this bout he had beat Yuriorkis Gamboa in May 2017 (Gamboa vs Castellanos) but he had also lost to Oscar Escandon in 2016 (Castellanos vs Escandon). 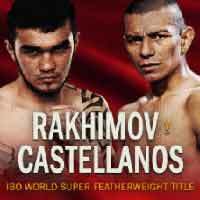 Rakhimov vs Castellanos is valid for the IBO World super featherweight title (Rakhimov’s second defense). Watch the video and rate this fight!